3-D model with a lenticular inclusion is a synthetic demo model for SW3D package MODEL. 3-D B-spline approximation of the model PREM (Dziewonski and Anderson 1981), specified in geographical spherical coordinates. Guide to the input data for the complete ray tracing program. 3-D model with four homogeneous layers separated by dipping plane interfaces. Sample 3-D synthetic models of a salt dome. 3-D Western Bohemia a priori model prepared as a test model resembling the conditions of refraction seismic measurements performed in Western Bohemia. 3-D model of a real geological structure provided by Institut Francais du Petrole. Present version contains only two of seven structural interfaces. Generating PostScript files with the sections across model L7 displaying the P-wave velocities. Two-point ray tracing in model L7, adding rays to the VRML or GOCAD files with interfaces. 2-D Marmousi model is based on real geological structure (Versteeg & Grau 1991). Smoothing the Marmousi model for Gaussian-packet migrations. Optimization of the Shape of Gaussian Beams in the smoothed Marmousi model. Decomposition of the wave field into optimized Gaussian packets. Gaussian packet migration in the smoothed Marmousi model. Zero-offset ray tracing in the smoothed Marmousi model. 1-D model RM consists of a thin homogeneous low-velocity layer covering homogeneous halfspace. Weakly anisotropic model QI for comparison of synthetic seismograms with package ANRAY. Sample synthetic 3-D model created during the technical session of the SW3D consortium meeting in June 1998. The model is composed of three layers separated by two interfaces. A salt body in the middle layer is bounded by a spherical interface. 1-D anisotropic "simplified twisted crystal" and "oblique twisted crystal" models. Simple smooth 3-D model to demonstrate network ray tracing in the paper by Klimes and Kvasnicka (1994). 2-D model of a real geological structure with a salt body by Scott Morton of the Amerada Hess Corporation. Smoothing the model for Kirchhoff migrations. 1-D constant velocity gradient model by Pascal Podvin (Podvin and Lecomte 1991). 3-D SEG/EAGE Salt Model with features similar to those of the U.S. Gulf of Mexico salt structure (Aminzadeh et al. 1997). Building the Salt Model by inversion. Ray computations in the smoothed Salt Model. 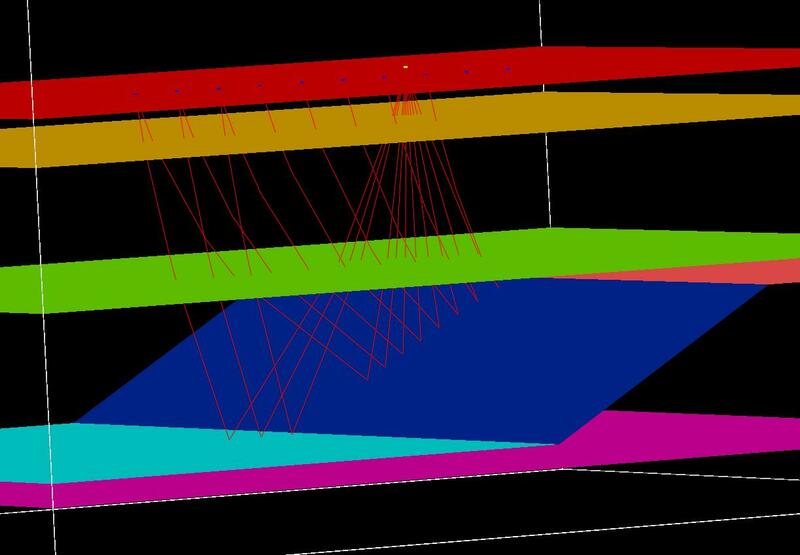 2-D model Pluto 1.5 of a real geological structure with a salt bodies created by Smaart Joint Venture. Building model Pluto 1.5 by inversion. Four test examples on running the program 'rtcoef.for' to control the computation of R/T coefficients using the subroutine 'coef52.for'. Several models of a real structure in the Cotton Valley site based on a simultaneous inversion of the data by James Rutledge. Simultaneous inversion of the arrival time data for model and hypocentral parameters. 3-D analytical model with five homogeneous layers separated by dipping plane interfaces. Sample synthetic 3-D model created during the technical session of the SW3D consortium meeting in June 2004. The model is composed of five layers separated by three planar interfaces and one interface composed of two horizontal and two tilted planes. History files to calculate different realizations of random media in terms of a white noise filtered by spectral filters enabling the random media used in geophysics to be specified (Gaussian, exponential, von Karman, self-affine, Kummer). Aminzadeh, F., Brac, J., Kunz, T. (1997): 3-D Salt and Overthrust Models. SEG/EAGE 3-D Modeling Series No.1., Soc. Explor. Geophysicists, Tulsa. Cormier, V.F. & Mellen, M.H. (1984): Application of asymptotic ray theory to vertical seismic profiling. In: Toksoz, M.N. & Stewart, R.R. (eds. ), Vertical Seismic Profiling: Advanced Concepts, pp. 28-44, Geophysical Press, London. Dziewonski, A.M. & Anderson, D.L. (1981): Preliminary reference Earth model. Phys. Earth planet. Inter., 25, 297. Klimes, L. and Kvasnicka, M. (1994): 3-D network ray tracing. Geophys. J. int., 116, 726-738. Podvin, P. & Lecomte, I. (1991): Finite difference computation of traveltimes in very contrasted velocity models: a massively parallel approach and its associated tools. Geophys.J.int., 105, 271-284. Versteeg, R.J. & Grau, G. (1991): The Marmousi experience. Proc. EAGE workshop on Practical Aspects of Seismic Data Inversion (Copenhagen, 1990), Eur. Assoc. Explor. Geophysicists, Zeist.